I've been smoke free for about 15 years now. That's some accomplishment. 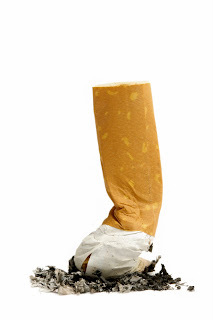 I began smoking when I was barely out of knee-pants. At 13, my father - a several pack-a-day man - philosopher that he was, told me he'd give me his permission but not his approval. Good enough for me. A 30-year habit was born. There were many times I attempted to snuff out the dreaded weed. Cold turkey, gum, patches - you name it, I tried it. Once I quit for a year, only to start again at a party. Stupid. And expensive. And in my teens I recall emptying out the ashtrays after a party and grinding the hard, stale tobacco into a pipe bowl to smoke because I'd run out of cigarettes. Oddly, that didn't make me quit. It just made me go out and buy a pack of smokes. Well, I tell you maybe I would have quit if something like this had happened to me. 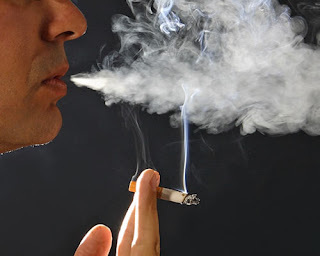 Some poor guy in Indonesia, where men apparently light up cigarettes more often than their libido (60% of Indonesian men smoke), got a big bang after partaking of his sickly addiction. No, not the Tiger Woods big bang kind of addiction. This guy lit up a cigarette and...BANG...it exploded...in his mouth. The poor fella lost six teeth and lived to tell the tale. Although, we're not entirely sure he could talk after the mysterious mini explosion. "TNT cigarettes - more bang for your buck!" "TNT - the cigarette trusted by terrorists"
I guess that's too much of a niche market. The fella involved says he's decided to give up smoking. Hmm...I wonder what convinced him? That would be a good way to stop, or at least repress, the bums around here that panhandle. They all ask for cigarettes. That would be too good to be true. Light it and weep. Ha! Only you would find a clever way to make this funny, funny, funny! And I can't believe you were an "ashtray diver"!!! Dumpster divers ain't got nuttin' on you! Yikes! This reminds me of the cigarette loads which were around during the 60's and 70's...ka-bang! I quit smoking years ago, but once a year I buy a pack, smoke 2 or 3, then I either throw the pack away or give it to a friend who still smokes. BTW, Thank you for the Best Follower Award, I've answered all the questions on my blog today! Don: Ha, ha, what a great gift for a panhandler: "Here, take two!" Quirks: I won't tell ya what I used to do when I used to drink. But it was sort of like ashtray diving. Me-Me: Since the last time I quit I've slipped once or twice, smoking a couple of cigarettes each time. And each time I turned green...worse than a hangover. I'll be over to see how you made out answering those questions. CL: Yeah that's true, smoking's a great appetite suppressant. And yet there was nothing like a cigarette after a great meal...or after waking up, or while shaving, or while driving, or while having a coffee, while drinking. Gee, and I quit again why? Wow, cool story! An explosive cig would be a novel way of quitting, though it would probably only bring those long cigarette holders back into vogue again. Tgoette: I hope smoking goes out of fashion before those long cigarette holders come back. This is weird cuz I was thinking just this morning about how long it took for my Mother to quit smoking...30 years! Weird because I don't know why that popped into my mind. Anywho. mama-face: About the length of time I smoked. Guess you could say it took ME 30 years to quit. Talk about weird. I started on Matinee. Graduated to Rothmans. Moved on to Players. Finished up with Export 'A'. Canadian cigarettes, eh. That is a weird story, and I hate it when things explode in my mouth. Wait. I didn't mean that like it sounded. I'm not gay. Although there's nothing wro.....Oh, never mind. I've dug myself into a hole, and I'm stuck there. I love the TNT Cigarettes. Great name! Congrats on ending smoking 15 years ago and for staying with it. When I was like 14, my mother put a carton of Spring cigarettes in my Christmas stocking. I find that odd to this day. Exploding cigarettes sound like a fine idea. Who doesn't like to have fun? Mike: I think there's a gum they advertise with flavour that explodes in your mouth. How about we stick with that? Jayne: Yeah, starting young your parents always knew what to give you for Christmas and birthdays - a carton of cigarettes! Strange times.